Here's a pic of the Gakken when it's put together - hopefully get some sort of video together at some point, I know we say that a lot but we do try...kind of. 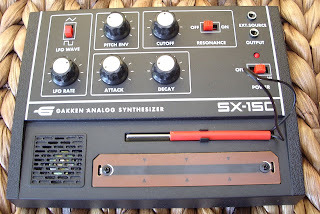 And here's a pic of yet another addition to our collection of vintage drum machines. 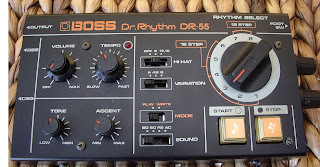 This is a DR-55 which is very similar to our Soundmaster SR88 but the hi-hats are restricted to 8's, 16th's or 12th's, rather than being programmable on the SR-88. This one had the addition of a couple of modds, one for the tuning of the kick and the other for it's decay, which makes this little machine even more interesting.